Calendars and Planners are essential Organizing Tools but the choices seem endless! When you visit your favorite bookstore or office supply shop at the end of a year, it seems that half the place is dedicated to planners and calendars! Did you know that one hundred million high-end calendars will be manufactured this year?! Entire temporary stores are set up with the sole purpose of selling calendars and planners! There are calendars that are themed with everything from "Learn French in One Year" to "365 Best Golf Holes," and there are loads of Planners, but which ones REALLY help you to plan? Although it is rather entertaining to browse these imaginative offerings, not all of us have the time available to do so. So I set about to do the pruning for you. The Family Plan-It calendar with its built-in magnetic hanger lets you hang it right on the fridge, keeping your family's schedule front, center and easy to see. You can easily keep track of up to five family members' activities with its extra large grid, tabbed contact sections, fold-down storage pocket and 494 stickers. A bonus week-at-a-glance whiteboard is also included. The Moms Plan-It calendar includes 17 months spanning months before and after a traditional school year. This calendar also has a built-in magnetic hanger so you can you hang it on the refrigerator. And as with the Family Plan-It calendar, a bonus week-at-a-glance whiteboard is also included. Of course there are numerous other excellent planning calendars but my intent is to give you popular family options to give you a starting point. Happy scheduling! Planners are a little more difficult to recommend because they depend highly on personal preference. The more versatile the planner the more easily you can customize them to work with your ever changing needs. In Summary, please take the time to look over a variety of calendars and planners which will help you to schedule and plan your/your family's activities and appointments. As you know there are endless choices available so there must be one suited just for you! Calendars and Planners top the most significant of organizational tools. It is difficult to stay organized without one! 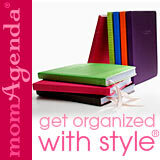 Go From Calendars And Planners To Home Organize It!